Best jogging strollers, how do you find what is right for you? Here you will find jogging stroller reviews by running moms for running moms, from the highest quality to the best bang for your buck. The mothers have taken many things into consideration such as quality of stroller, comfort for your baby, ease in travel and price so that you can find the perfect jogging stroller for your specific needs. Just click on the "Read Review" button for a full review of each stroller. Still having trouble deciding which stroller is best for you? Click here for a side by side comparison of these jogging strollers. Have a Jogging Stroller Review You Would Like to Share? 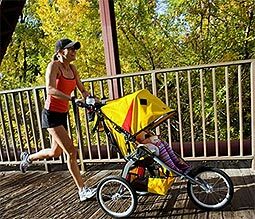 Do you have a great jogging stroller you would like to review? Or maybe you have a really lousy stroller you wouldn't buy for your worst enemy? Share your reviews here! Your review will appear on a Web page exactly the way you enter it here. You can wrap a word in square brackets to make it appear bold. For example [my review] would show as my story on the Web page containing your review. Can't live without my off-road BOB!